CONTROLRadioUK #IfWeLikeIt #WePlayIt: Coronation Street Review: "Communication Issues"
Coronation Street Review: "Communication Issues"
Tonight's Corrie began with Eileen sharing concerns with Billy over Sean's living situation, and Kate telling Rana there's no rush to tell her mum the truth about them (you can read more on how that turns out in the midnight spoilers). Thankfully Imran seems to know about the fake-up and we were saved any dramatic scenes on how you can lie to a dying man, and instead treated to Kate & Rana working on their communication. Understandably Rana doesn't want to make her father's funeral all about them. Understandably Kate doesn't want to be too pushy and is full of support because that's just what she does. Rana claimed she would eventually get around to telling, but Kate told her not to make promises and just wanted Rana to know she was here to talk instead of her being up all night worrying alone. Both positions in this are completely understandable, but whilst Rana is believing everything is ok as can be, that small look from Kate at the end of the scene showed how unnerved she truly is by the situation. Given everything her parents have put her through, and what we had to witness on Friday, only the hard of hearted are going to say Kate's fears are unjust. Am I gonna take a moment to appreciate the fact Kate actually researched this? Why yes, I am, because it's example 5673859429857594 of how in love these two dorks are, because some people wouldn't care enough about their loved ones to. Imran and Rana made their way to the funeral with Imran's ex-wife accompanying, but who cares about that when we have a 0.5 second of Kana being cuties with the 'I love you' and of course the kiss, so the writers continued to know how to feed well amidst unspoken tension. I'm pretty sure Corrie has now scarred me for life because every time someone talks about coming to senses, I just flashback to Friday and start crying again. Kate is obviously hiding her anger over the whole situation and trying her best to be supportive, whilst looking hot as hell cause Kate Connor can make even the most atrocious outfits look OK.
Imran decided Leanne was nothing more than a sympathetic hook-up when you're sad over a parents death, confirming once and for all Imran has no taste because seriously! Who on earth is so flippant to Leanne Battersby?! She then looked on with great curiosity at Imran and Rana getting into the car with Sabine, and whilst Leanne can obviously do much better, a choice between this and being needlessly angry with Peter for looking at Carla? I'm taking Imran all the way. Though Eileen's point on people being too proud to ask for help is true, I just don't connect with Sean's story. He's not the most sympathetic character and whilst I get the point they're trying to make with all of this, it's just falling on deaf ears here. Sally meanwhile managed to keep pleasantries and offer condolences for Hassan dying, despite the fact Imran's job is to put her behind bars. There were already rumours in the press that the Rovers would be getting a makeover and tonight's episode laid the foundations for that, with Jenny believing the place needs a new spark of paint to bring in new customers. Johnny meanwhile just wantsto throw a big party for everyone, which is a mood I can totally feel as alcohol apparently bonds. In love triangle news no-one cares about, things between Faye/Seb/Emma came to a head with Sally dishing out some useful love advice, because it's just the lesbians she struggles to match make. It seems to have been slightly forgotten that the reason Seb initially stopped speaking to Faye was because she was stalking Eileen. Continuing his fine match making Geoff is trying to give Sally and Tim some space so they can patch things up, and in the process a burner phone was found. Whilst Geoff and Gina want to get rid of the phone, Dev's playing it straight and thinks Sally deserves to know and they can't hide it cause soaps gotta soap. Tim and Sally are of course alerted to the situation and all give their best shocked face. I meanwhile am just wondering how often exactly Duncan was in Sally's house to be able to hide the phone away so well. Sally knows it's Duncan's handiwork. Tim meanwhile is having more doubts about Sally. Dev continues being straight Dev and Gina just wants rid. I struggle to believe just how exactly Tim can doubt Sally's word, when only a few weeks ago he was suspicious over Duncan's intentions. These two have always had a good relationship and most importantly trust, so Tim suddenly questioning everything just because of Duncan who is a proven liar? Just doesn't ring true. Geoff thinks the police can help. Tim calls the police to register the evidence. Dev fills Gina in on the situation and she's just trying to work out how to help Sally. When the police turn out, the phone has of course gone walkies. Gina's then forced to admit that she's thrown the phone away because of course. Though the phone is recovered, Gina ends up getting banged up temporarily because a soap copper remembered what preventing the course of justice is. In more news we don't care about, Claudia paid Audrey a visit to talk about Lewis and Audrey's secret prison visit. Audrey does truly think giving Gail her money back and handing himself in means Lewis has truly changed this time. I truly don't care but am always here for Claudia since she's fun. After being caught with the group of homeless people Sean spinned even more lies which Billy somewhat believed but still had questions. He's worried Sean is depressed and Sean continues to spin lies until Carol pops along. She joins Sean in the lie but it is blatantly obvious to all involved that Sean is lying and again I just don't care. Because it's not all doom and gloom this week, we get a lil bit of cuteness between Kate and Jenny, who pops into the Bistro to flog the Rovers big party. We also get some cuteness between two of my faves Kate and Leanne. 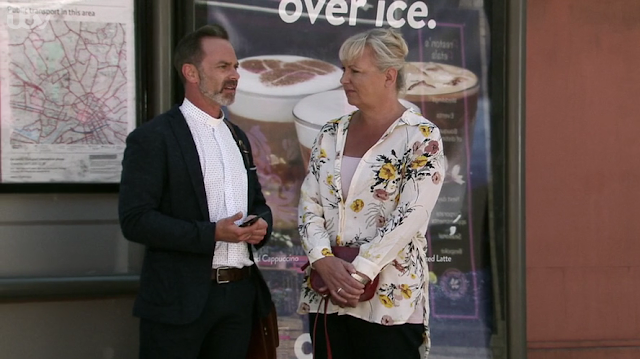 She informs Leanne that Imran is off at the funeral and starts to unravel a little of her feelings before stopping herself and advising Leanne that Imran is a top bloke. She does later catch up with Imran at the lawyer's office where they're both full of apologies and decide to give the whole working thing another chance, whilst Leanne also asks how he's feeling because she's too good. Rana of course goes to Kate for comfort after the funeral and Kate tries to be supportive as ever whilst airing frustrations over not being able to support Rana. It then goes from bad to worse when Rana admits she's moving out. Kate obviously isn't happy with this and neither is Rana, but she's unfortunately back in the mentality of putting everyone before herself and having to do this because her mum's grieving. There is a again a massive lack of communication between the two of them which is frustrating to watch but completely understandable, as they are both the types of people to hold back for other people's happiness. Rana constantly reminding Kate that the fake-up was her idea probably isn't doing any favours, since it was just supposed to be a temporary thing to get her in to see her dad. It was not by any means supposed to be a thing that goes on and on, and I am getting war flashbacks to Rana telling Kate she would tell Zeedan about them. The episode of course ends with Gina getting out on a caution but Sally is on a very long road, and she's not the only one.